I’m fickle when it comes to furniture–change it like many people change their underwear. 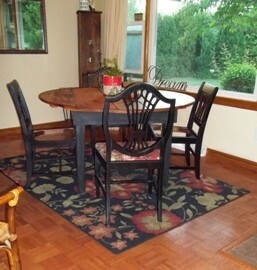 The current table is the 4th to grace our dining room in the past 6 months. Most people don’t use their dining tables. But we aren’t most people. We ALWAYS gather around our table. Often with friends and family. For long dinners, with our laptops, for homework and often just to talk. 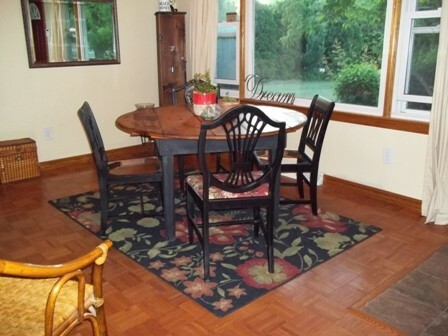 Drives us all crazy when there is no table in the dining room. I sold one in May and we’ve been without a table for a few weeks. But I got a ‘new’ table last weekend. 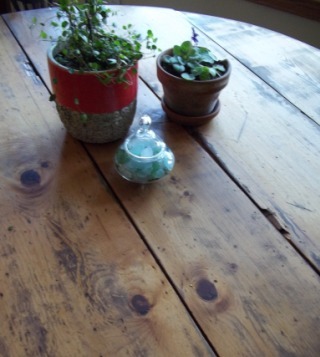 Or a ‘new’ OLD table. I spotted it months ago. LOVED it. But it was pushing $100. Which doesn’t fit into my furniture budget. Had my eye on it for six months. At my favorite vintage furniture store that is more like a giant indoor flea market. Watched it get marked down a couple of times.When it was clearanced on top of being marked down a few times, I grabbed it. It has a unique planked, rustic look. Meaning it is already scratched, dented and all banged up. 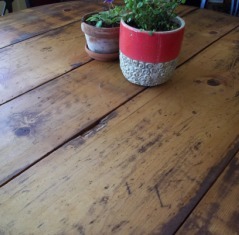 Because it was handmade 60+ years ago, the boards are irregular and uneven. Perfect. It fits right in at my house. Once home, I stripped and re-finished the top. As best I could anyway, with all the grooves and bumpy wood. Then I repainted the table legs and two of my white chairs black. Since I was short two chairs, I went next door to Chapman’s Boutique to see what she had ‘in stock’ in her garage. (or her shed, basement…) Chapman is my neighbor, who has an eye for vintage treasures, as well. Not much she doesn’t bring home. Of course, she had a couple of chairs. And she said to go ahead and take them. So I did. Then painted them black. Son: We have FOUR matching chairs??? Me: Not matching, exactly. But almost. And similar styles. Nothing I like less than a SET of perfectly matched furniture. Boring. Lacking creativity and style. No fun. And completely impractical. What happens when one of the matched chairs gets broken? And they do when the large, 6’2″ teenage boys start wrestling around, or drop down (hard) into a chair. Darling Daughter is away for the week, but she will be thrilled to return home to a table. I am keeping the table. For now.